Invisible Italy is an experience that allows viewers to travel through three stunning reproductions of three of the most famous historical sites in Italy. Each historically significant location has it’s own 360° video that can be explored as a 3D digital model and experience it in Virtual Reality for the BBC One show. A new TV series features London based 3D scanning company, ScanLAB Projects. 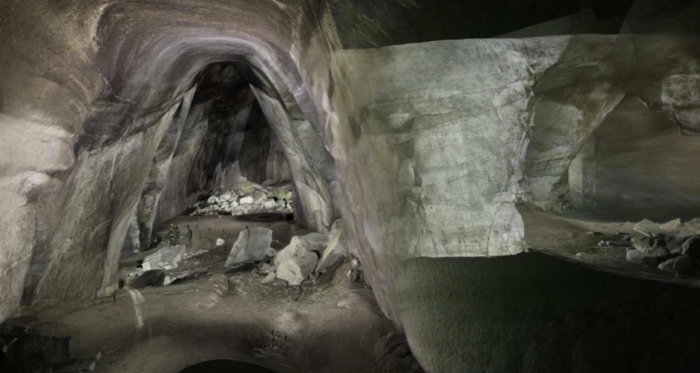 For ‘Italy’s Invisible Cities ScanLAB Projects have created stunning 3D images of tunnels and deep sea treasures found beneath the surface of 4 of Italy’s biggest cities: Venice, Naples, Rome and Florence. In Naples, you can visit the ruins of the ancient Roman holiday resort of Baiae with its reputation for vice and debauchery. In Venice you can explore the Doge’s palace in its stunning setting on St Mark’s Square. And in Florence you can fly above the river Arno and discover the secret passageway Florence’s rulers built to travel around their city unseen. New technology places a crucial role across the shows. In the Bay of Naples we scan frescos underwater using sub-sea LIDAR techniques. In Venice the entire length of the Grand Canal is mapped in the only way possible – from a moving boat. And in Florence the entire Vasari corridor is mapped in under an hour using mobile, backpack scanning. Each show ends with an immersive experience as the presenters don VR headsets and revisit key locations from the show virtually. This final dissection process gives the freedom to explore entire locations at 1:1 scale and as miniature dollshouse replicas, offering new and often impossible perspectives. The programmes are each accompanied by interactive 360 content online for audiences to explore. These unique experiences allow the audience to navigate the same datasets captured on location by the scanning team and used to make the original show graphics. Italy’s Invisible Cities takes us on an unprecedented journey through three of the world’s most incredible urban areas – NAPLES, VENICE and FLORENCE. ScanLAB Projects joins presenters Alexander Armstrong and Dr Michael Scott as they explore the hidden spaces that have helped these great cities change the world. The programmes bring a fascinating, fresh perspective to 2,000 years of history, from the original Roman bath complex outside Naples, through the reign of the Venetian Doge’s to the birth of the Renaissance in Florence. In Naples we explore the Bourbon Tunnels, a true time travelling experience through original Roman cisterns that latter became 17th century aqueducts, 19th century escape tunnels and finally second world war air raid shelters. The team map in unprecedented detail the tragic ruins of Herculaneum, Roman quarries and Neapolitan catacombs, before ended in Baiae at the original Roman pleasure baths, much of which is submerged under the Bay of Naples. Venice sees ScanLAB take to the water, scanning the entire length of the Grand Canal and the naval might of the Arsenale. We also reveal the original ghetto, the Jewish quarters and the stunning, secret synagogues nestled inside unassuming facades. The show’s finale explores the Doge’s Palace, revealing the intricate and interlaced public and private spaces that allows this single building to act as the city’s equivalent of 10 Downing Street, The House of Parliament, Buckingham Palace and the torture chambers of the Tower of London. In the series finale the scans reveal Florence as the birthplace of the Renaissance. Here it is less the infrastructure of quarries and aqueducts that are unearthed but instead the intense, lavish interiors of palazzo’s, corridors of power and collections of art. We explore the length of the Vasari corridor weaving through the city, across Ponte Vecchio and its contents, one of the world’s most extensive art collections – the Uffizi Gallery. We capture the interiors of Palazzo Vecchio, Palazzo Medici and Michelangelo’s secret chamber, hidden beneath the Church of San Lorenzo. The show ends in the Duomo with a detailed exploration of Brunelleschi’s Dome, one of the world’s most amazing and mysterious feats of engineering. 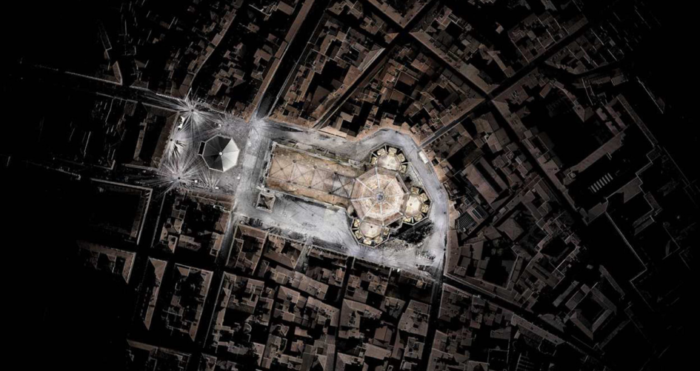 BBC’s Italy’s invisible cities series, will allow viewers to explore visible and hidden corners of these renaissance cities with 3D digital models. The 3D point cloud models obtained from the real cities allow the public to go on a digital journey, through all the facades, walls, and even below water, to uncover the secrets kept in the streets and buildings of these cities that have 2,000 years of history. 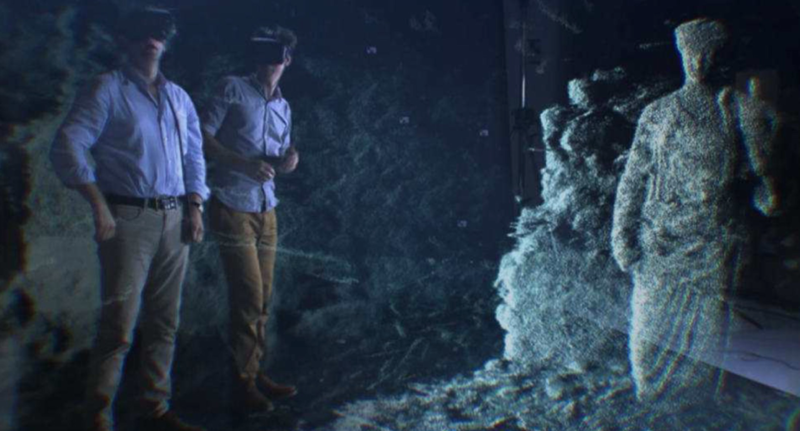 Alexander Armstrong narrates the journey as the virtual 360 camera navigates through these complex digital models, stripping away façades, bursting through walls and even beneath the waves to reveal their hidden historical secrets. In Naples, you can visit the ruins of the ancient Roman holiday resort of Baiae with its reputation for vice and debauchery. In Venice you can explore the Doge’s palace in its stunning setting on St Mark’s Square. And in Florence you can fly above the river Arno and discover the secret passageway Florence’s rulers built to travel around their city unseen. Authors want to allow the audience to see the beauty of the 3D pointcloud models for themselves as demonstrated in the show and see how they can be used to uncover hidden historical secrets. This is a great example to see how much appetite there is for 360° video content. It would be useful to see the difference in engagement between this content on a more accessible platform and the Rome VR taster project which is also going to be live and promoted in the same place. New technology places a crucial role across the shows. In the Bay of Naples we scan frescos underwater using sub-sea LIDAR techniques. In Venice the entire length of the Grand Canal is mapped in the only way possible – from a moving boat. And in Florence the entire Vasari corridor is mapped in under an hour using mobile, backpack scanning. Each show ends with an immersive experience as the presenters don VR headsets and revisit key locations from the show virtually. This final dissection process gives the freedom to explore entire locations at 1:1 scale and as miniature dollshouse replicas, offering new and often impossible perspectives. 360 videos are available for watching on YouTube. 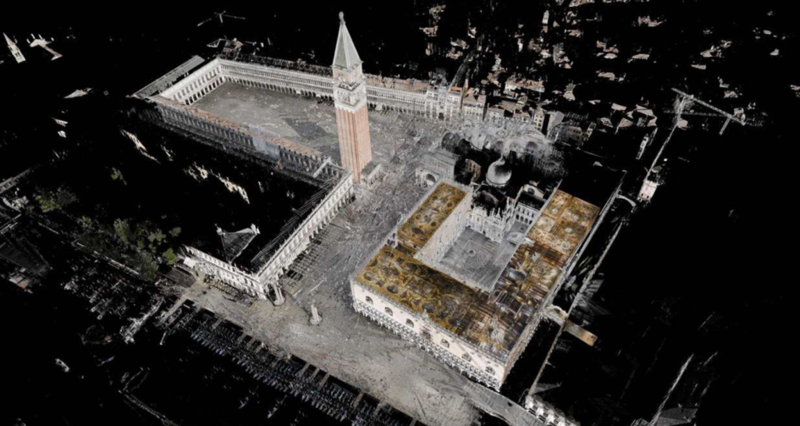 The 3D images in Invisible Italy 360 were made possible using FARO 3D scanning equipment. FARO scanners played a significant role in offering new and previoulsy impossible insights into these cities. Sub-sea LIDAR scans were used in the Bay of Naples to scan underwater and take viewers back in time to explore the Bourbon Tunnels as well as the ruins od Herculaneum, Neapolitan catacombs and Roman Quarries. The whole lenght of the Grand Canal in Venice was also scanned from a moving boat. Other historical sites that the show unvieled was the original ghetto, the secret synagogues and the Jewish quarters. In addition, FARO scanners mapped the enter Vasari corridor including scans of the Uffizi Galley in under an hour. FARO have been providing measurement hardware and services since 1981. The FARO Focus X HDR scanners used by the ScanLAB Projects team for Invisible Cities are typically used for measuring large areas for building construction and planning. These 3D scanners operate using a high-precision laser-beam to read solid surfaces and, rather than building up an entire 3D model, it processes this image of an area as a series of points that make an overall cloud of how an area appears. Once created, this point cloud is refined to create a complete and colored 3D image. With a little tinkering it is possible to then turn these files, or at least portions of them, into 3D printable objects, as ScanLAB Projects did in their previous project at Sir John Soane’s Museum. Light slows down when it travels through water, not only that, but floating debris, leaves and fish all make scanning the sea bed extra challenging. Additionally, the tunnels connecting all 15 kilometres of the Bay of Naples are increasingly winding and dark, and the same goes for Vasari Corridor in Florence. In comparison to the other techniques (photogrammetry, SFM and structured light) laser scanning is capable of underwater and underground tunnels scanning. As long as the water is not too murky, and the labyrinths are not too winding, FARO scanners seem to have no issue with collecting data from metres from away to an impresive accuracy. Invisible Italy 360 represents some of best practices that will help to develop VR experiences that users will enjoy and that will bring cultural heritage and digital technologies closer together through immersive experiences. The models were created using cutting-edge laser scanning technology to create detailed full-colour pointclouds of real spaces in and under selected cities during the filming of Invisible Cities. These virtual models were rendered in stereoscopic 3D for Google Cardboard. The project uses WebVRtechnology to display the virtual reality experience in a browser, so the user has no need to download any other software or apps. The sound has been recreated and mixed in adaptive 3D through stereo headphones. Exactly where other technologies face limits, the Leica Pegasus:Backpackshows its virtues step after step. Using the most adaptive carrier – the human body– professionals just need to wear it to start collecting data. Designed with an ultralight carbon mono frame and excellent ergonomics, it captures the environment by using two LiDAR scanners and five high dynamic cameras, generating an accurate, fully registered and colorized 3D point cloud model even in GNSS denied areas by using SLAM (Simultaneous Localization and Mapping) positioning technology. With the Pegasus:Backpack as a partner, the team could climb, kneel or crawl if needed to collect the data. Armed with a powerful flash light module, even in absolute darkness, the Pegasus:Backpack provided clear images of the underground buried Naples – helping to create one of the most comprehensive 3D maps of Naples ever produced. Advanced 3D Laser Solutions uses FARO scanners to capture data and create 3D models of storage facilities, pipelines and storage tanks. Scan time is a fraction of what it would be for manual data collection and the accuracy of the measurements is +/- 2mm, reducing potential down-time and saving labour costs for facility managers. The data can be used to create 3D models and video fly-thru’s of the facility, detect thinning of tank walls and low points in tank floors ahead of NDT work, and be kept on file to assist in other ways in the future. For example, should the facility wish to expand or make changes to layout, accurate and detailed measurements are at the facility manager’s fingertips. The main purpose, according to authors, was to find out how people get on with the VR experience – not just how it looks but if it makes them feel excited, increases their curiousity of Rome or just makes them feel a bit nauseous. Next reason was to learn if this project attracts a new audience to history topics and if using VR makes documentaries more immersive. Following the success of our collaboration with the BBC in Rome, BBC ONE’s new series Italy’s Invisible Cities takes us on an unprecedented journey through three of the world’s most incredible urban areas – NAPLES, VENICE and FLORENCE. ScanLAB Projects joins presenters Alexander Armstrong and Dr Michael Scott as they explore the hidden spaces that have helped these great cities change the world. The programmes bring a fascinating, fresh perspective to 2,000 years of history, from the original Roman bath complex outside Naples, through the reign of the Venetian Doge’s to the birth of the Renaissance in Florence. The scanner’s technology exposed the inner workings of these previously unseen historical sites in incredible detail, unveiling a secret world. Each programme was accompanied by YouTube videos that allowed viewers to explore the captured data in 360, for a fully immersive experience. 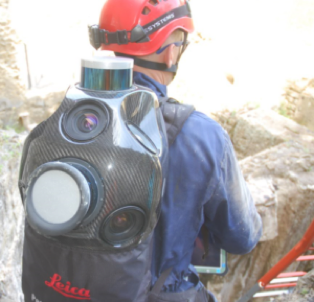 The programme highlighted the huge advantages laser scanning can have in the archaeological sphere, however this new technology has also been gaining recognition for its use in other applications and industries. The programmes are each accompanied by interactive 360 content online for audiences to explore. These unique experiences allow the audience to navigate the same datasets captured on location by the scanning team and used to make the original show graphics.